Although the United Steel Workers Organizing Committee (SWOC) won a contract from the largest steel company, U.S. Steel, in 1937, the “Little Steel” corporations— including Bethlehem Steel Corp., Republic Steel Corp., Youngstown Sheet and Tube, National Steel Corp., Inland Steel Co. and American Rolling Mill Co. Republic Steel—refused to recognize the new union. In May 1937, steel workers from these plants struck for union recognition, including the workers at Republic Steel on Chicago’s South Side. The “Little Steel” corporations were controlled by its anti-union chair, Tom M. Girdler. Under his direction, Republic had stockpiled a large accumulation of weapons to be used against strikers. SWOC s t ruck at Republic, Youngstown Sheet and Tube and Inland all at once in a broad front. On May 26, 1937, 25,000 workers went out on strike. Inland Steel and Youngstown Sheet and Tube closed in response, but many Republic mills remained opened, including the Chicago South Side plant, where about half of the 2,200 workers went on strike. In defiance, Republic Steel shipped in food and bedding so their scabs wouldn’t have to cross the picket line. 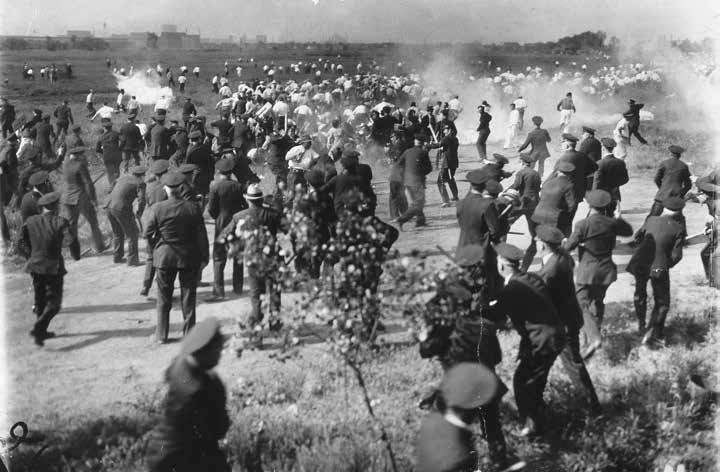 On the first day of the strike, the Chicago police went right into the mill and pushed out the union men. Then they tore into the picket outside the plant, making the workers move to a location two blocks away, while arresting some of them. The next day, the police, who had joined the remaining workers inside the plant, came out and beat picketers with their clubs, shooting their guns in the air. During the confrontation, the strikers’ sound truck was demolished, and women strikers were beaten and sent to jail. The SWOC strike committee called a meeting in response. On May 30, 1937, over 1,000 strikers and picket supporters, many of them women and children, gathered at Sam’s Place, a bar near the Republic Steel plant that became strike headquarters. There, SWOC organizers and reps from Amalgamated Clothing Workers outlined the history of the national labor movement in support of the right to organize, and how the passage of the Wagner Act by the Roosevelt administration had helped. According to the SWOC leadership, membership increased from less than 100 members in 1936 to over 75,000 members, despite anti-union efforts by the corporations. The SWOC leaders compared the pickets at Indiana Harbor plant that were without incident to the police tactics that violated the Wagner Act at Republic Steel. Resolutions against police conduct were approved by the assembly of strikers. From the floor of the assembly, a motion was made that strikers should form a line to set up a picket outside the plant. From Sam’s Place the assembly lined up behind two American flags. One version of the story is that they went directly in a paradelike fashion to an open field outside Republic Steel, some in their Sunday dress, some setting up soup kitchens in support of a rally. A platform was constructed from which families could hear speeches as they picnicked. Girls led IWW fight songs. Another version is that marchers followed the procession behind the flags down Green Bay Avenue on the South Side, but the route changed to a dirt road across a prairie at 114th Street and Green Bay, and that they were cheering the Congress of Industrial Organizations (CIO). At this point they were met with a police lineup of over 200 police. Photographers from the local papers arrived in time to take photos of the confrontation of strikers and picket supporters in the prairie where they had assembled as they were confronted by the cops. Police officials yelled expletives at them, calling them “communists” and demanding that they leave. Picketers shouted back that the police barrier violated their rights and the Wagner Act. Some accounts claim members of the strike-support crowd heaved rocks and other objects at the police. Onlookers, such as David Krech, a researcher in psychology and member of the social democrat organization, New America, witnessed 10 people being shot and 80 being wounded, as the Chicago police opened fire on the “symbolic picket line” of steel workers and their wives and children in holiday dress. Krech and his New America comrades had supported the pickets from the start, only to witness the police violence. A Senate investigation would later show that police had used weapons from the stockpile at Republic Steel along with their own issue to shoot directly into the rally and onlookers. As police shot at workers killed and injured at the picket be prosecuted. A “Paramount News” photographer had used newsreel photography to record events that day, but the story was suppressed by Paramount. An investigation conducted by the St. Louis Dispatch revealed the censorship of the footage that eventually was used as evidence in the Lafollete Civil Liberties Commission investigation into the massacre by the police. Seventy-five years later workers marched in procession to the location of the plant to commemorate the mass murders and pay tribute to the strikers. People met at Washington High School on 114th Street in Chicago for an educational event about the massacre. U.S. Rep. Jesse Jackson Jr. joined the discussion. Panelists and discussion participants walked to the site of the killings, across the street from The Zone Youth Center and placed a wreath. According to journalist Gregory Tejeda, the Illinois Labor History Society showed newsreel footage of the police beatings at the event. It was explained that at that time, a coroner’s jury in Cook County found all 10 deaths to be “justifiable homicide.” Not a single police officer was prosecuted. Jackson described at the event how the 1937 Memorial Day travesty was called a “labor riot” caused by “red communists.” He outlined his plan to introduce legislation to raise the minimum wage and also to pay tribute to the 10 union members who died 75 years ago.